AH-64E Apache Guardians arrived at Wheeler Army Airfield. 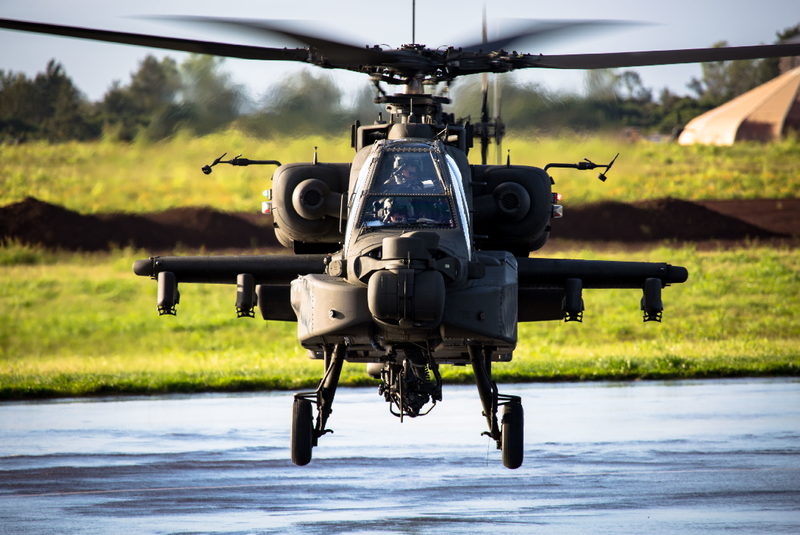 Taken on Jan. 6, 2016, the following pictures show four AH-64E Apache Guardians assigned to 16th Combat Aviation Brigade (CAB), based at Joint Base Lewis-McChord (JBLM), Washington, preparing for take off from Joint Base Pearl Harbor-Hickam (JBPHH), Hawaii and then flying in formation and landing at Wheeler Army Airfield, to train with 2-6 Cavalry, 25th CAB. During their six-month deployment at Wheeler, 16th CAB aircrews will not only take part in several exercises, including Lightning Force and RIMPAC (Rim of the Pacific), but will also fill the void of attack/reconnaissance coverage for the 25th Infantry Division after the retirement of the OH-58D Kiowa Warrior. 16th CAB has been the first U.S. Army unit to field the AH-64E when it started operations with the type in 2014. Currently, the U.S. Army plans to procure a total of 690 Guardians, with 634 being remanufactured AH-64Ds and the remainder new-build helicopters.